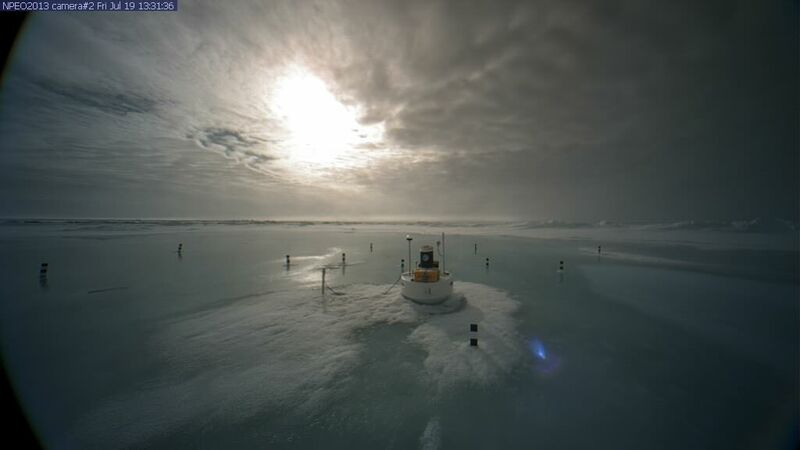 This was what our hero, APL’s North Pole Ice Camera #2, looked like about two weeks ago. The only open water was a far-off leed barely visible in the upper left hand corner of the image. 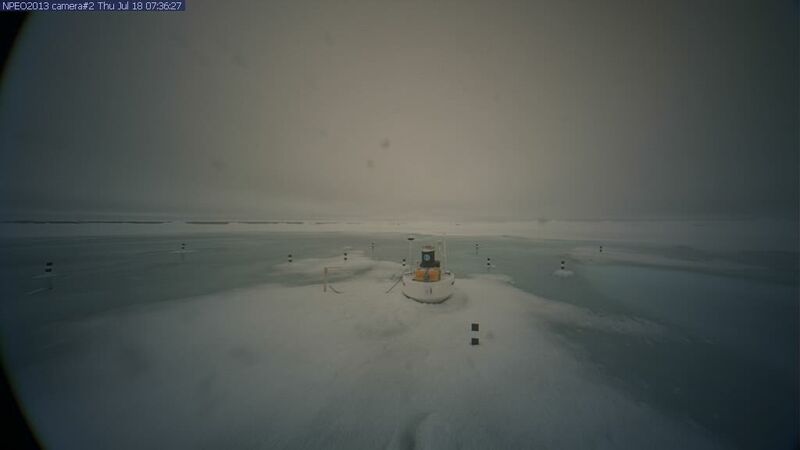 Then, about a week ago, melt began to set in on the ice sheet surface near the North Pole. Things started to look bad for North Pole Camera #2 as small puddles of very cold water began to appear. Was there much hope our Camera #2 might stay dry? It was, after all, just July 13th. And there was still more than a month and half of melt season left. What was a North Pole Camera to do? And as the water continued to advance, the answer became clear: start learning to swim. 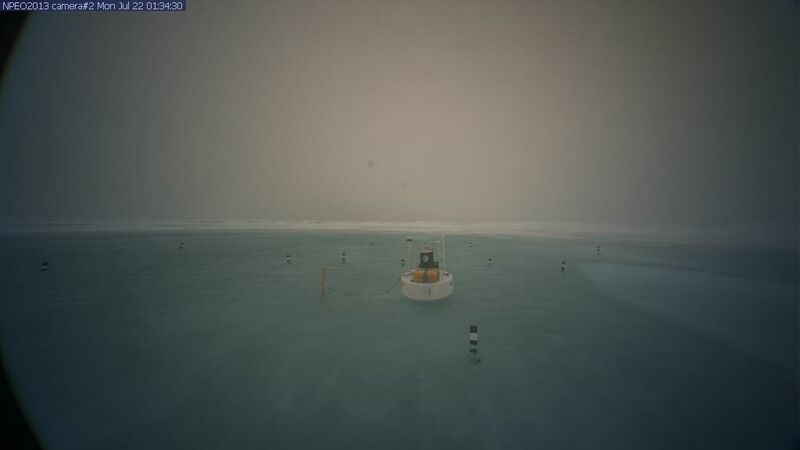 In this image, taken on July 18th, we see North Pole Camera #2 just starting to get its feet wet. North Pole water is quite cold! But not so cold as Arctic ice or wind or snow. These the North Pole Camera was very used to. In fact, it was built to handle such harsh weather. 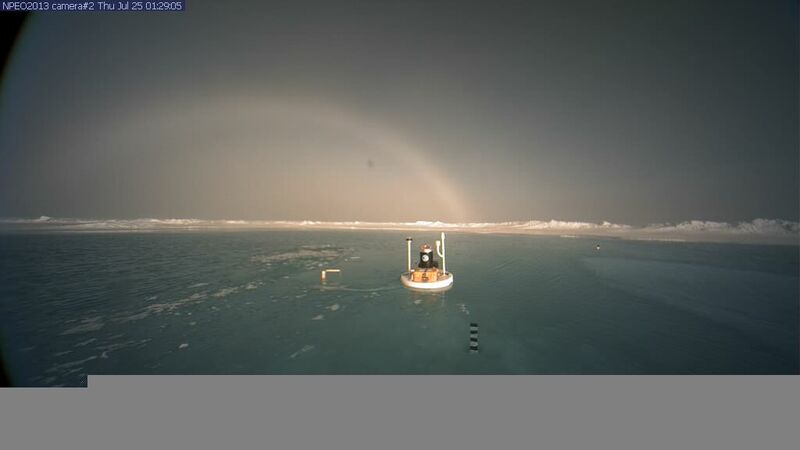 So North Pole Camera #2 had some reason to hope for staying warm if it got wet. But could it stay afloat? Camera 2 now in icy water. Then, just one day later, Camera #2 found itself standing alone in the icy water. It was now in the midst of a large melt lake with very little snow cover left. Our Camera #2 now knew what was coming. And it was ready. 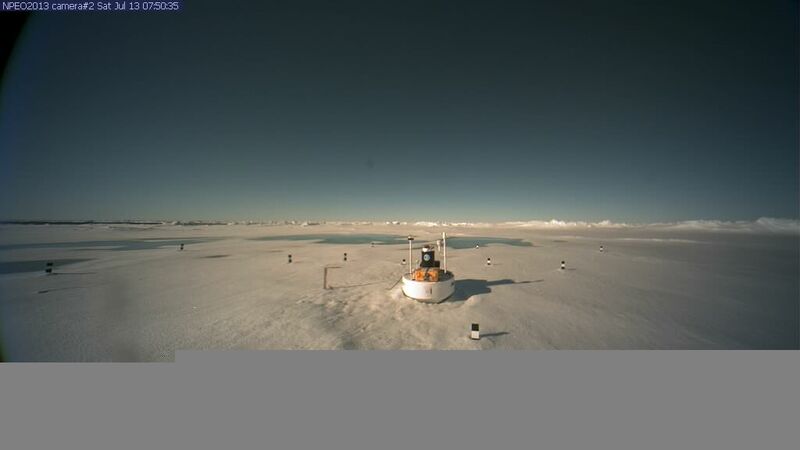 A good thing, because North Pole Camera #2 soon found itself with more than 1 foot of melt lake water splashing around its base. It was a miserable, windy cloudy day and our camera sat alone, tethered to a stake, in a giant, expanding melt lake. It couldn’t help but wonder if soon it would have to face the open ocean. Clouds mounded all around it, and weather reports called for a massive storm. Our North Pole Camera #2 knew that in recent years such Cyclones increasingly broke, cracked and flooded the thinning ice it was sent to observe.